National.Restaurant Association -- "Buoyed by positive same-store sales and solid optimism among restaurant operators for continued growth, the outlook for the restaurant industry remained positive in April. 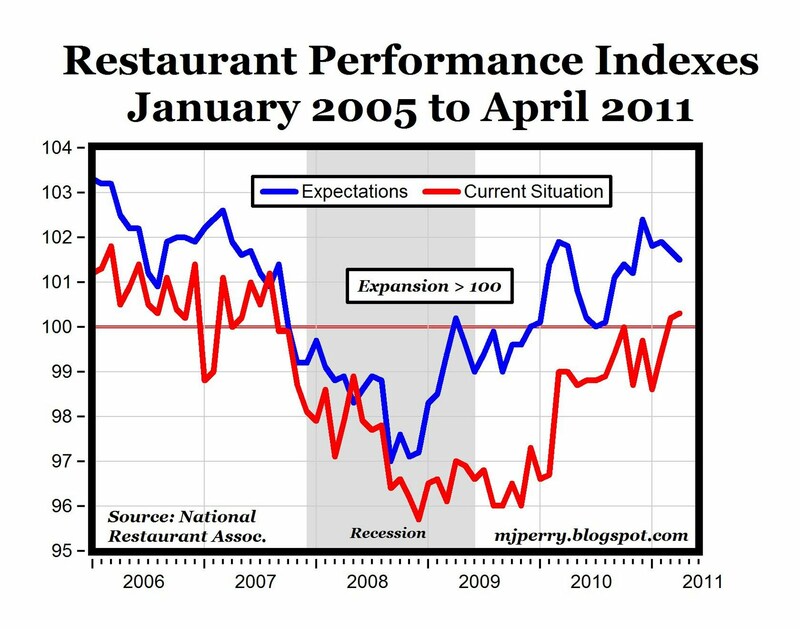 The National Restaurant Association’s Restaurant Performance Index (RPI) – a monthly composite index that tracks the health of and outlook for the U.S. restaurant industry – stood at 100.9 in April, essentially unchanged from a level of 101.0 in March. In addition, April represented the 5th consecutive month in which the RPI stood above 100, which signifies expansion in the index of key industry indicators. The Current Situation Index, which measures current trends in four industry indicators (same-store sales, traffic, labor and capital expenditures), stood at 100.3 in April – up slightly from a March level of 100.2. In addition, the Current Situation Index stood above 100 for the 2nd consecutive month, which signifies expansion in the current situation indicators (see chart above). The Expectations Index, which measures restaurant operators’ six-month outlook for four industry indicators (same-store sales, employees, capital expenditures and business conditions), stood at 101.5 in April – down from a level of 101.7 in March. The Expectations Index stood above the 100 level for the 9th consecutive month, which signifies expansion in the forward-looking indicators (see chart above)." MP: At 100.3, the Current Situation Index in April was at the highest level since July 2007, almost four years ago. 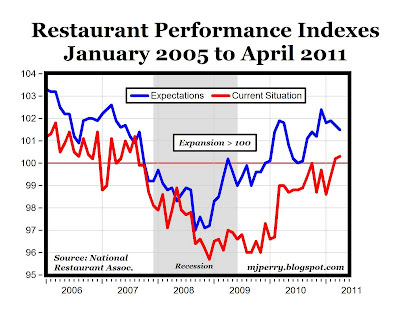 It's also the first time since the summer of 2007 that the Current Situation Index has remained above the benchmark 100 level, which signals expansion of restaurant activity. Marcellus Shale Coalition – "The Pennsylvania Department of Labor & Industry – like a host of news outlets across the region and the nation – continues to keep a watchful eye on the powerful job creation engine called the Marcellus Shale, the world’s second largest natural gas field behind one in Iran. "Nearly 48,000 people have been hired in the last year by industries related to drilling in the Marcellus Shale, and 71 percent of those people were Pennsylvania residents. Nine thousand of them were hired in the first three months of 2011. The average salary was higher than the statewide average. And the rate of hiring is accelerating." MP: The chart above shows that while the overall employment level in the state is still more than 100,000 jobs below the pre-recession level, mining employment barely slowed at all during the recession. 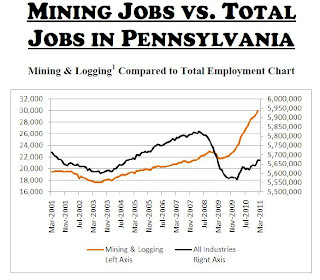 In the last eight years, mining jobs in Pennsylvania have almost doubled, and have increased by more than 36% in just the last two years. FINANCIAL POST --"Small business tax incentives are keeping businesses in Canada small, hindering business efficiency and disproportionately benefiting the wealthy, according to a new study from the University of Calgary. The study, authored by Jack Mintz and Duanjie Chen of The School of Public Policy, said that Canada’s small business tax rate creates a “wall of taxation” in the country that keeps businesses small so they can remain in favorable tax brackets. Instead of job growth, the authors said that the small business tax rate has led to an abundance of small businesses in Canada that have no intention to grow. Furthermore, the authors said that wealthy Canadians have used the favorable tax rate as a tax shelter, incorporating small businesses to avoid high personal income taxes." 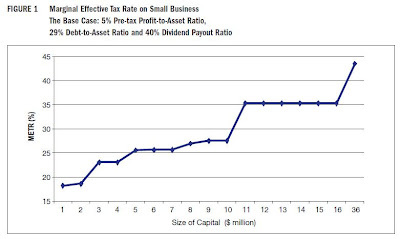 "We show that small business growth is hampered by the existing tax system. 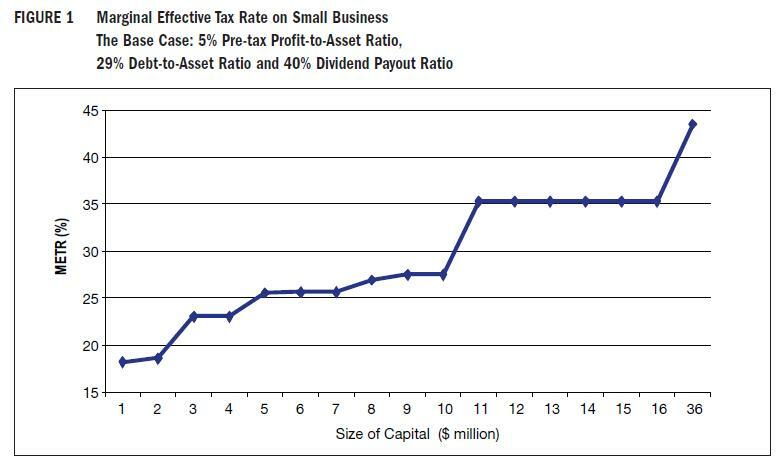 As a business grows, effective tax rates on capital investments made by entrepreneurs virtually double when the business grows from as a little as $1 million to over $30 million in asset size (see chart above)." 1. Could the 50-year United States embargo against Cuba finally be lifted after the discovery of an enormous oilfield in Cuban waters (20 billion barrels, with drilling to start within the next few months)? 2. Alaska Governor Sean Parnell said he plans to continue to "vigorously pursue" tax-cuts for oil companies as a way to boost production in the state. Hope Sen. Max Baucus is paying attention. 1. If ticket scalping laws that make it illegal to sell a ticket to a concert or sporting event above face value are a good idea, shouldn't selling a coin, bond, car, or house above face value, sticker price or list price also be illegal as well? If not, why not? 2. Name the main arguments in favor of selling a coin, bond, car or house above face value/list price. Aren't all of them equally good arguments for allowing people to sell tickets above face value? 1. If the minimum wage is a good idea, shouldn't unpaid internships be illegal as well? If not, why not? 2. Name the main arguments in favor of the legality of unpaid internships. Aren't all of them equally good arguments for allowing people to work for wages greater than zero and less than the minimum wage? The Conference Board reported increases this week for the Leading Economic Index in the Euro Area (0.4% in April), Mexico (0.8% in March) and Australia (0.4% in March). The video above documents how the Institute for Justice filed a federal lawsuit and successfully overturned an El Paso, Texas city ordinance that prevented food trucks from operating within 1,000 feet of an established restaurant or convenience store, which effectively turned the entire city of El Paso into a "No Vending Zone." It's another IJ victory for economic liberty and the right to earn an honest living, and a defeat for economic protectionism. U.K. North Sea Oil Companies "Going Galt"
UK Independent -- "North Sea oil production has slowed to its lowest level since records began 15 years ago following the Chancellor of the Exchequer's recent tax raid on the industry. An update from the U.K. Department of Energy yesterday showed the biggest fall in oil production since quarterly records started in 1995. Gas production fell 17.6 per cent from a year ago. The slowdown follows the Chancellor's controversial Budget decision to increase the supplementary tax on North Sea Oil production to 32 per cent from 20 per cent to pay for a cut in petrol duty. The Chancellor's decision drew an industry-wide outcry and claims that mature fields would be closed. An Oil and Gas UK survey warned that a quarter of 240 potential projects in the North Sea were less likely to go ahead after the tax increase." MP: Let this be a lesson to the Senate Democrats who are proposing to burden (punish?) 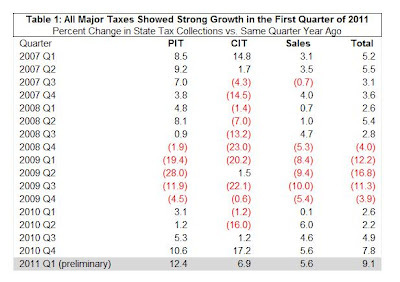 America's five biggest oil companies with $21 billion in additional income taxes over the next decade. 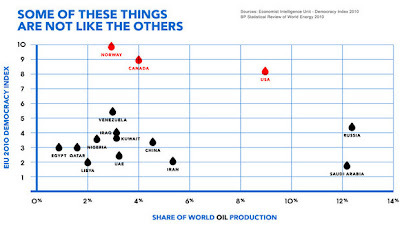 The chart above is from a Bloomberg article and shows that "Most of the world's oil is produced in states that are undemocratic. 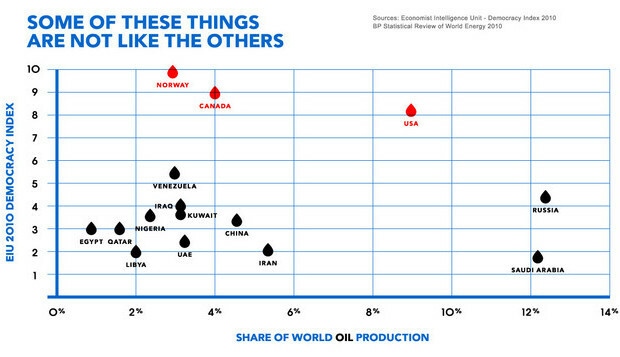 The U.S., Canada and Norway are the exceptions." a) "Oil wealth strongly inhibits democratic transitions in authoritarian states, and b) Oil’s anti-democratic effects seem to vary over time and across regions: they have grown stronger over time, but do not hold in Latin America. The mechanism that seems to account for the oil-autocracy link is the ‘rentier effect’ – the combination of low taxes and high government spending that seems to dampen support for democratic transitions." "The Texas field, known as the Eagle Ford, is just one of about 20 new onshore oil fields that advocates say could collectively increase the nation’s oil output by 25 percent within a decade — without the dangers of drilling in the deep waters of the Gulf of Mexico or the delicate coastal areas off Alaska. More than a dozen companies plan to drill up to 3,000 wells there in the next 12 months." "There is only one catch: the oil from the Eagle Ford and similar fields of tightly packed rock can be extracted only by using hydraulic fracturing, a method that uses a high-pressure mix of water, sand and hazardous chemicals to blast through the rocks to release the oil inside. The technique, also called fracking, has been widely used in the last decade to unlock vast new fields of natural gas, but drillers only recently figured out how to release large quantities of oil, which flows less easily through rock than gas. As evidence mounts that fracking poses risks to water supplies, the federal government and regulators in various states are considering tighter regulations on it." The oil industry says any environmental concerns are far outweighed by the economic benefits of pumping previously inaccessible oil from fields that could collectively hold two or three times as much oil as Prudhoe Bay, the Alaskan field that was the last great onshore discovery. The companies estimate that the boom will create more than two million new jobs, directly or indirectly, and bring tens of billions of dollars to the states where the fields are located, which include traditional oil sites like Texas and Oklahoma, industrial stalwarts like Ohio and Michigan and even farm states like Kansas." Thanks to Thomas Keene and Dan Greller for the pointers. What's Stopping Job Creation at Medium-Sized Firms? It's Washington's "Climate of Uncertainty"
I highly recommend this very insightful Bloomberg article "Economic Stagnation Explained, at 30,000 Feet" by Yale law professor Stephen Carter, based on his conversation while flying and sitting next to a successful business owner, about how regulatory and tax uncertainty is preventing job creation at small and medium firms. Because he faces a "climate of uncertainty" created in Washington, the successful business owner refuses to hire new employees despite rising demand and sales for his company's products. For medium-sized firms like his, however, there is little wiggle room to absorb the costs of regulatory change. Because he possesses neither lobbyists nor clout, he says, Washington doesn’t care whether he hires more workers or closes up shop." MP: Thanks to the anonymous businessman for making a very strong "laissez-faire" ("allow to do" in French) case for job creation. 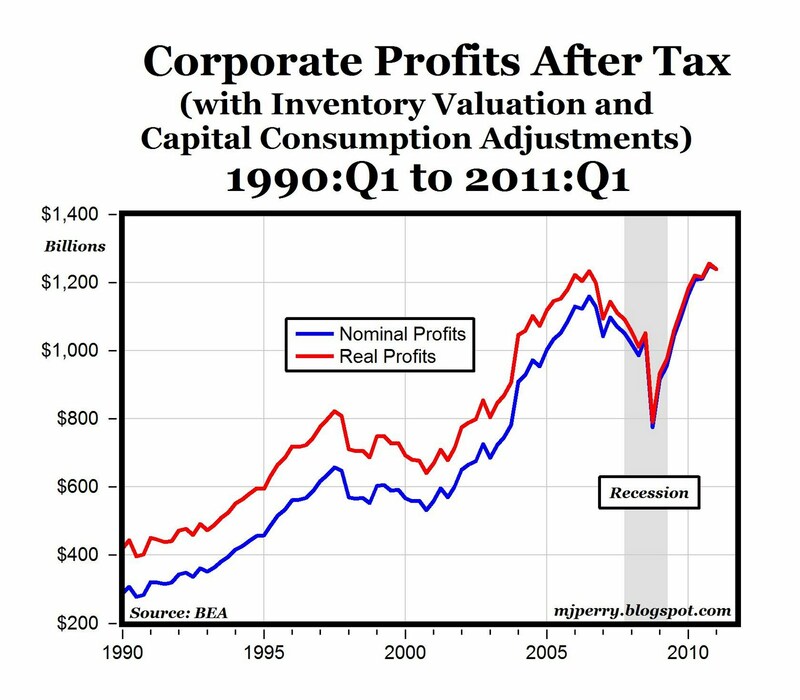 Corporate profits after tax (unadjusted) reached a new record high in the first quarter of 2011 of almost $1.5 trillion. 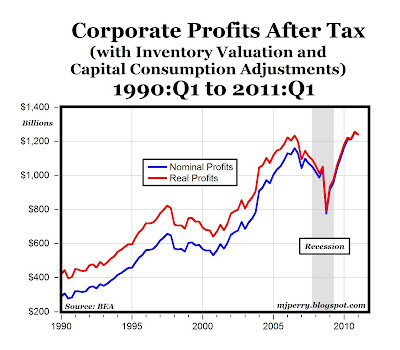 After adjustments for inventory and depreciation, after-tax corporate profits in the first quarter dipped slightly from the all-time high in the last quarter of 2010, but remained above the pre-recession peak levels of 2006 for the second consecutive month, both in nominal and real terms (see chart above). It was the seventh consecutive quarterly increase in real profits from their year-earlier level following ten straight quarters of annual declines starting in 2007, and suggests that corporate profitability has completely recovered from the effects of the 2007-2009 recession. Looking ahead, the record-level profits mean that U.S. companies now have the resources to propel the expansion forward with increased spending on capital investments and increased hiring. See also Scott Grannis' related post "Corporate Profits Remain Very Strong." The Rockefeller Institute of Government reported this week that tax collections by state governments are showing strong improvements in the first quarter of this year compared to the same quarter of 2010. Overall, tax collections increased by 9.1% in the first quarter of 2011 (based on preliminary tax collection data from 47 early reporting states), which is the largest increase since the second quarter of 2006, almost five years ago (see chart above). 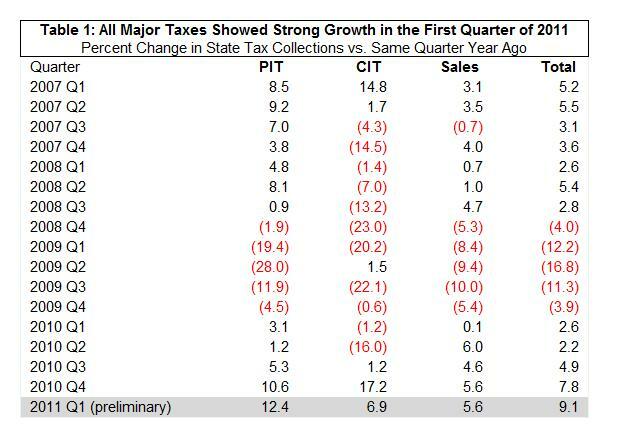 The largest gain in the quarter came from a 12.4% increase in personal income tax collections, followed by increases in corporate income taxes (6.9%) and sales taxes (5.6%). 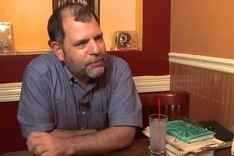 Bloomberg profiles George Mason economist, blogger, infovore, speed reader Tyler Cowen. Intrade Founder and CEO John Delaney, R.I.P. Business Insider -- "John Delaney, founder and CEO of Intrade, the prediction market, has died while trying to climb Mt. Everest. 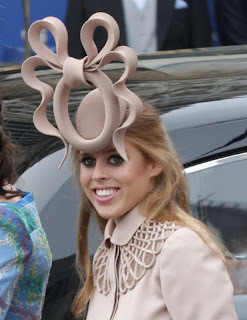 He was less than 50 meters from the top, according to the Daily Mail." Washington Times -- "An extensive study released Wednesday in the journal Business and Politics found that the investments of members of the House of Representatives outperformed those of the average investor by 55 basis points per month, or 6 percent annually, suggesting that lawmakers are taking advantage of inside information to fatten their stock portfolios. Strict laws ban corporate executives from trading on their insider knowledge, but no restrictions exist for members of Congress. Lawmakers are permitted to keep their holdings and trade shares on the market, as well as vote on legislation that could affect their portfolio values." MP: How about we just "legalize it?" Insider trading that is. Jeff Rubin -- "Why has Global Sticks, a manufacturer of wooden ice cream sticks, moving from Dalian, China to Thunder Bay, Ontario? It’s the kind of low margin manufacturing that is never supposed to come back after it leaves North America for cheaper labour abroad. But wage costs are no longer everything they were cranked up to be. In today’s world of soaring energy costs, power rationing and export taxes on key commodities such as wood, wage gaps are less important. When the power goes off, it suddenly doesn’t matter if your labor is expensive. Factories don’t run on sweat alone." Thunder Bay -- "The Global Sticks factory will produce up to six billion food-grade wood sticks each year from northern white birch, a species that is underutilized by the forestry industry. The decision to relocate to North America came as a result of the recognition that manufacturing wooden sticks in China was going to become a much more difficult and expensive process given increasing fuel costs. With assistance from the province, Global Sticks will switch from sourcing products from China to manufacturing products at a new, state-of-the art facility in Thunder Bay that created 50 construction jobs. 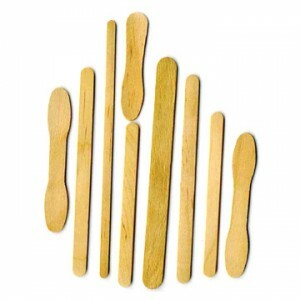 The new plant will employ 130 permanent workers and produce a variety of wooden sticks used for ice cream bars, corn dogs, tongue depressors for doctors and nurses, and paint paddles (see photo above)." MP: We can probably expect a lot more of this type of shift in manufacturing production from China back to Canada and the U.S. The Boston Consulting Group predicts that "Sometime around 2015, manufacturers will be indifferent between locating in America or China for production for consumption in America." Important factors include rising wages and prices in China, an appreciating yuan, and rising energy costs both for production in China and for shipping goods to North America. From the Washington Post article "From China, An End Run Around U.S. Tariffs"
"To avoid a 2005 U.S. tariff on Chinese-made wooden bedroom furniture, Chinese furniture companies moved operations to other Asian countries, thwarting U.S. efforts to curb “dumping,” the export of goods at unfairly low prices (see chart above). 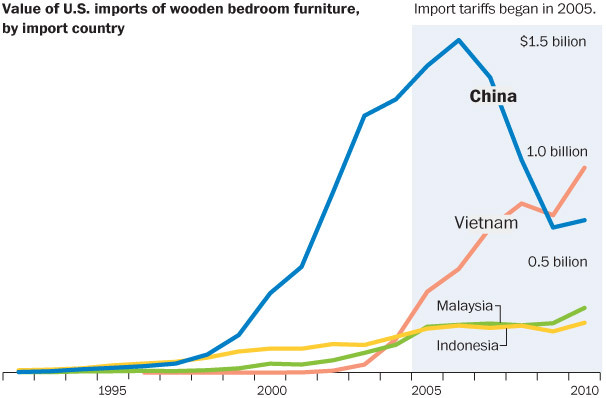 The result: Imports now account for about 70 percent of the U.S. market for beds and similar items, up from 58 percent before Washington intervened to try and protect domestic manufacturers from Chinese “dumping,” or the export of goods at unfairly low prices. The only Americans getting more work as a result of the tariffs are Washington lawyers, who have been hired by both U.S. and Chinese companies. Their work includes haggling each year over private “settlement” payments that Chinese manufacturers denounce as a 'protection racket.'" Cato's Dan Ikenson responds thoughtfully here on the Forbes blog. Update: The chart below shows the significant decline in the CPI for Furniture and Bedding over the last ten years, which is now at about the same level as in the early 1990s. Thanks largely to competitively priced imports, Americans today have the most affordable furniture in U.S. history. 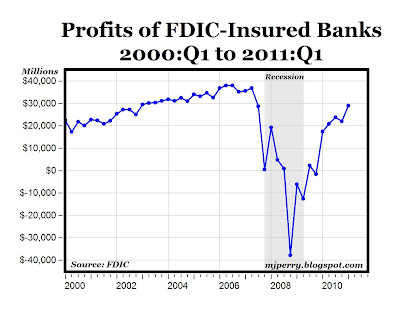 "Commercial banks and savings institutions insured by the Federal Deposit Insurance Corporation (FDIC) reported an aggregate profit of $29 billion in the first quarter of 2011, an $11.6 billion improvement (66.5 percent) from the $17.4 billion in net income the industry reported in the first quarter of 2010. This is the seventh consecutive quarter that earnings registered a year-over-year increase. For the sixth consecutive quarter, reduced provisions for loan losses drove the improvement in earnings. Net income was the best for the industry since the $36.8 billion earned in the second quarter of 2007 (see chart above). "The industry shows continuing signs of improvement," said FDIC Chairman Sheila C. Bair. She added, "though there is a limit to how far reductions in loan-loss provisions can boost industry earnings." More than half of all institutions (56 percent) reported better quarterly net income from a year ago, and only 15 percent had a net loss for the quarter. The average return on assets (ROA), a basic yardstick of profitability, rose to 0.87 percent from 0.53 percent a year ago. The number of institutions on the "Problem List" flattened. The net increase of four, to 888, is the smallest in three-and-a-half years. The number of "problem" institutions is the highest since March 31, 1993, when there were 928. Total assets of "problem" institutions increased from $390 billion to $397 billion. Twenty-six insured institutions failed during the first quarter, the smallest number in the last seven quarters." MP: Despite the strong rebound in bank profits to pre-recession levels, there was a 3.2% annual decline in bank revenues in the first quarter and an accompanying decline in loan balances, suggesting that bank credit availability is still lagging (see Washington Post story here). 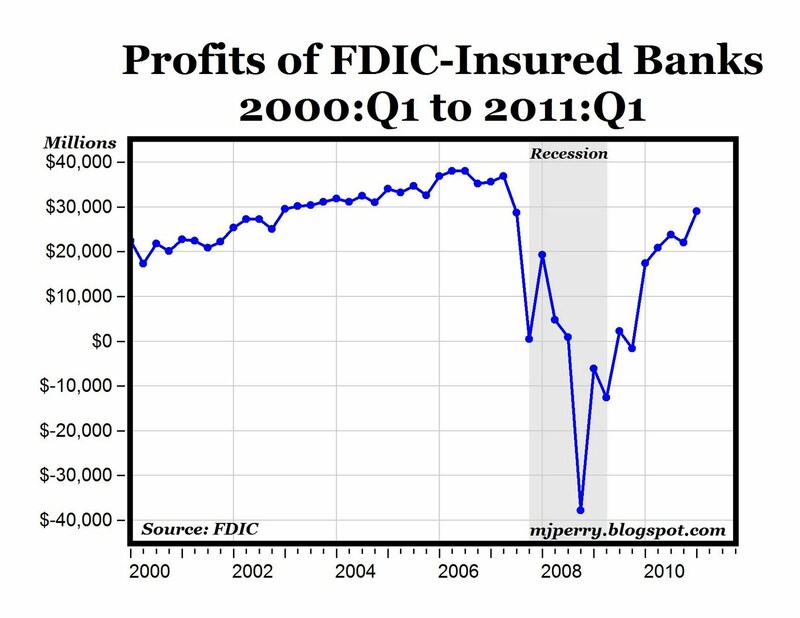 But the fact that bank profits have fully recovered to early 2007 levels is another sign that the worst of the financial crisis is far behind us, and the U.S. banking system is once again healthy and profitable. Corrected for coffee price in $/kg. 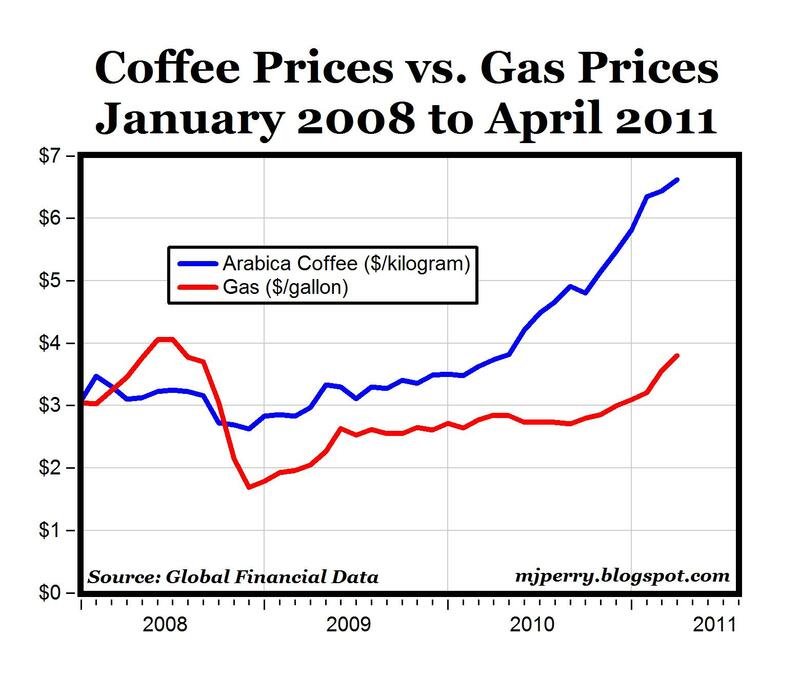 In January 2008 coffee prices (per pound) and gas prices (per gallon) were about the same: $3 (see chart above). Coffee prices have more than doubled to $6.60 per pound, making the increases in gas prices to $3.80 in April look relatively minor. 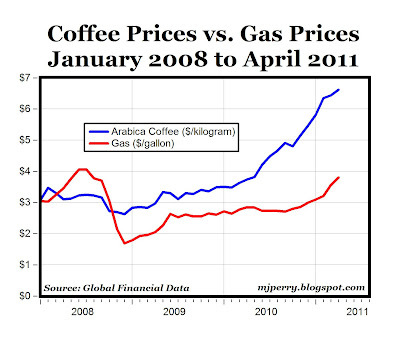 Over the last year, coffee prices have increased by 77% compared to the 34% increase in gas prices. What's next? Congressional investigations to determine if speculators are driving up coffee prices? Allegations of "price gouging" at Starbucks? Investigations of "windfall profits" for "Big Coffee"? Update: The units for coffee are now correctly stated in $/kilogram (not $/pound as originally labeled, I apologize for the mistake). The main point here is that coffee prices have increased by 77% over the last year, or more than twice the 34% increase in gas prices. The fact that the units are different ($/gallon vs. $/kilogram) doesn't change the fact the coffee price have increased twice as much as gas prices. No adjustment for inflation is necessary here because we are comparing two nominal prices. The top chart above shows the long-term trends in the shares of GDP for: a) private services-producing industries and b) private goods-producing industries. From being close to parity in 1947 with services representing 48% of GDP vs. 40% for goods, the services/GDP ratio is now almost 69% compared to the goods/GDP share of less than 18%. In 1948 there was $1.20 in services produced in the U.S. for every $1 of goods produced, and by 2010, that services-goods ratio had increased to $3.9 to $1. The bottom chart above helps explain some of the shift over time from goods to services, by showing that the CPI for services has increased more than the overall CPI by almost 1% per year, while the CPI for durable goods has increased almost 2% less than the overall CPI. 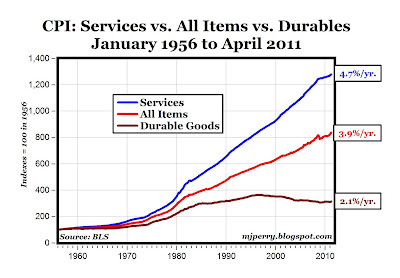 In other words, the real price of services has been rising by almost 1% per year, and the real price of durable goods has been falling by almost 2% per year. To put it in perspective: on average, $100 of goods and services purchased in 1947 would have cost $820 by 2010. 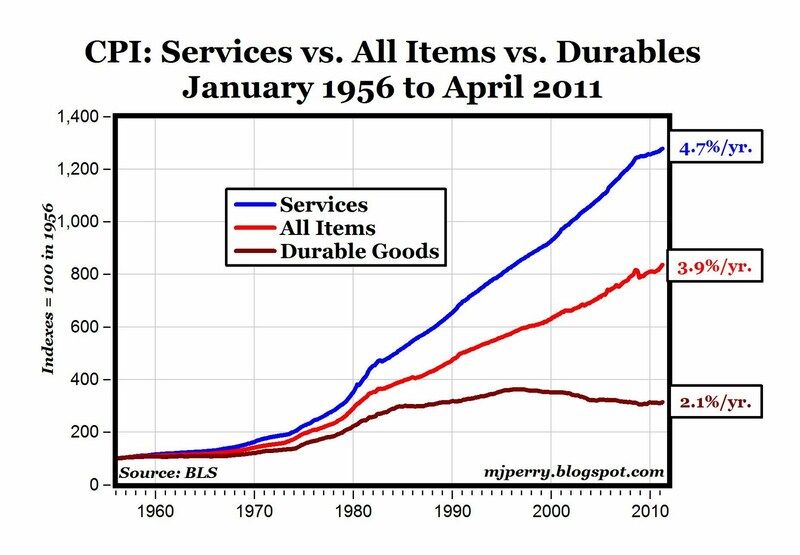 But consider this difference - $100 of services purchased in 1947 would cost $1,250 today; $100 of durable goods in 1947 would only cost $314 today by comparison. In other words, manufactured goods are a real bargain and they keep getting cheaper over time. What's behind the difference in price trends? Productivity gains in manufacturing have been greater than the gains for services, which has lowered real consumer prices for manufactured goods relative to services, resulting in a lower goods/GDP ratio and a higher services/GDP ratio. The trend for manufacturing of: a) increased productivity leading to b) lower real consumer prices resulting in c) a lower share of GDP follows the same pattern for agriculture over the last two hundred years. And yet when have you heard anybody talk about "the decline of U.S. farming," or make the claim that "we just don't produce any agricultural products any more"? It's not true for farming, and it's not true for manufacturing. Sold on Ebay for $130,733. Bulgaria's black market in blood is flourishing. What's a College Degree Worth? Interactive graphic of median earnings by college major and subject area. Full article here from The Chronicle of Higher Education on the earnings of 171 college majors. "One surprising characteristic unites the majority of America’s top high school science and math students – their parents are immigrants. While only 12 percent of the U.S. population is foreign-born, 70 percent of the finalists in the 2011 Intel Science Talent Search competition were the children of immigrants (see chart above). Just 12 of the 40 finalists at this year’s competition of the nation’s top high school science students had native-born parents. While former H-1B visa holders comprise less than 1 percent of the U.S. population, 60 percent of the finalists had parents who entered the U.S. on H-1B visas, which are generally the only practical way to hire skilled foreign nationals. Finalists’ parents sponsored through a family preference category represented 7.5 percent of the total, about four times higher than their proportion in the U.S. Many immigrant parents place a heavy emphasis on education, particularly in math and science, viewing this as a path to success in America. 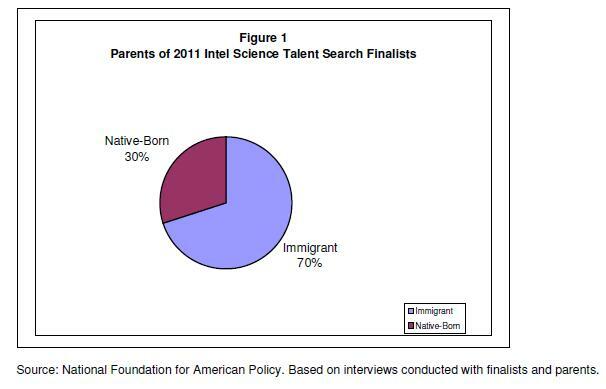 An important implication of the study is that preventing the entry of H-1B visa holders skilled immigrants, and family-sponsored immigrants would shut off the flow of a key segment of America’s next generation of scientists and engineers - the children of immigrants - because we would not have allowed in their parents. The benefit America derives from the children of immigrants in science and math is an additional advantage the country reaps from being open to talent from around the world. Americans should take pride in our openness to individuals and their children who can succeed in the U.S. without regard to class or place of birth. Liberalizing our nation’s immigration laws will likely yield even greater rewards for America in the future." From the Conclusion: "The results also should serve as a warning against new restrictions on legal immigration, both family and employment-based immigration, since such restrictions are likely to prevent many of the next generation of outstanding scientists and researchers from emerging in America. The talents possessed by these children of immigrants are a wonderful gift to America, a gift we can all benefit from in the future so long as we can allow talented foreign nationals to come to the United States and pursue their American dreams." 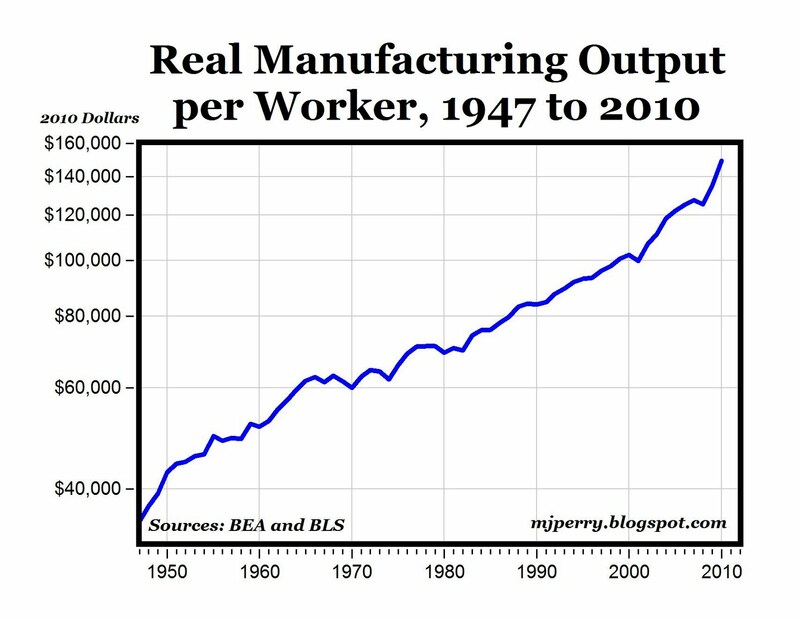 "Between 1970 and 1990 manufacturing declined from 25.0 to 18.4 percent of GDP. International trade explains only a small part of the decline in the relative importance of manufacturing to the economy. 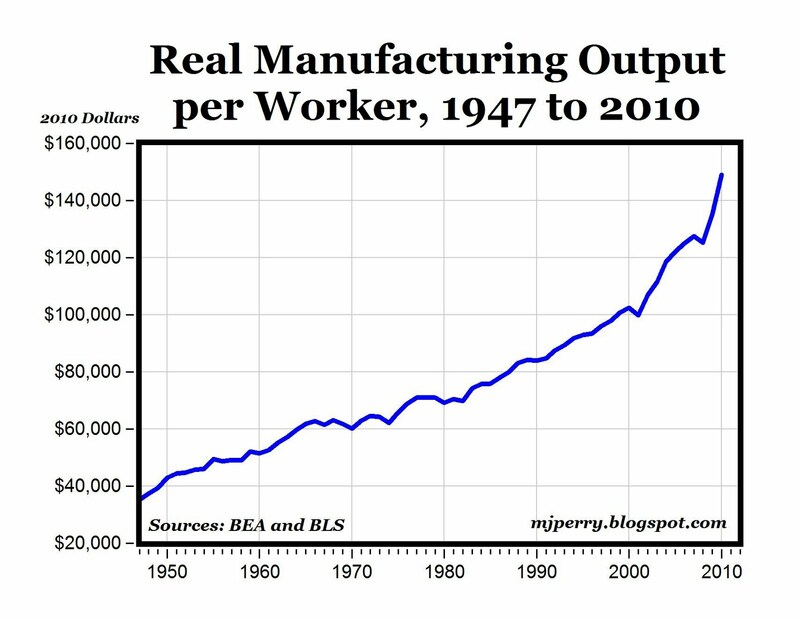 Why then has the share of manufacturing declined? The immediate reason is that the composition of domestic spending has shifted away from manufactured goods. In 1970, U.S. residents spent 46 percent of their outlays on goods (manufactured, grown, or mined) and 54 percent on services and construction. By 1991, the shares were 40.7 percent and 59.3 percent respectively, as people began spending comparatively more on, for example, health care, travel, entertainment, legal services, fast food and so on. 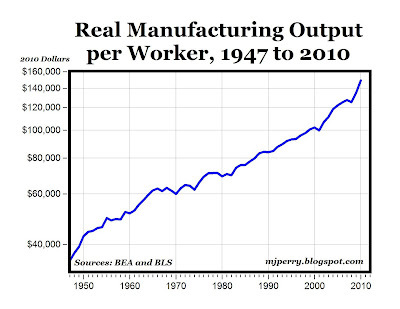 It is hardly surprising, given this shift, that manufacturing has become a less important part of the economy. In particular, U.S. residents are spending a smaller fraction of their incomes on goods than they did 20 years ago for a simple reason: goods have become relatively cheaper. Between 1970 and 1990 the price of goods relative to services fell 22.9% percent. 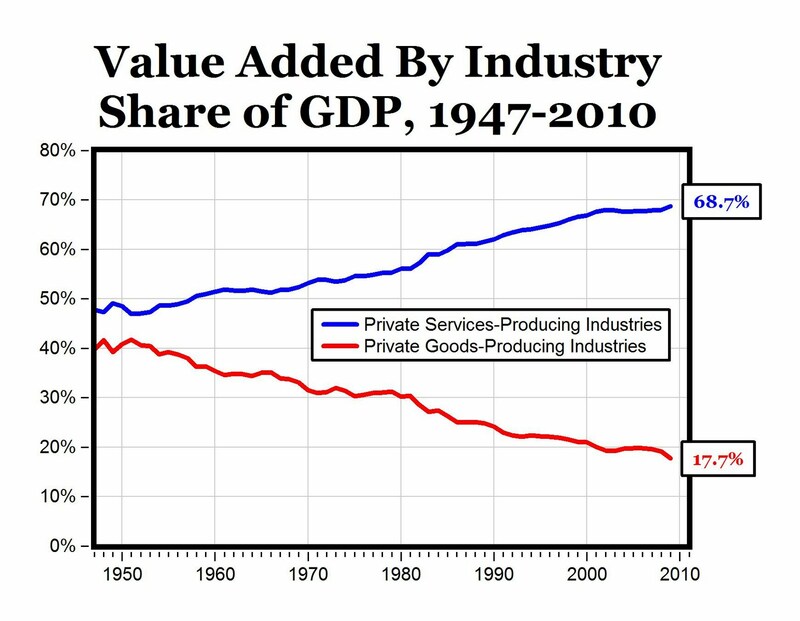 Goods have become cheaper primarily because productivity in manufacturing has grown much faster than in services. The growth has been passed on in lower consumer prices. Ironically, the conventional wisdom here has things almost exactly backward. Policymakers often ascribe the declining share of industrial employment to a lack of manufacturing competitiveness brought on by inadequate productivity growth. In fact, the shrinkage is largely the result of high productivity growth, at least as compared with the service sector. The concern that industrial workers would lose their jobs because of automation is closer to the truth than the preoccupation with a presumed loss of manufacturing because of foreign competition." 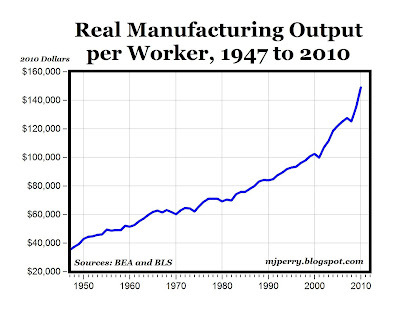 MP: The chart above shows the incredible increases in U.S. manufacturing productivity, which has made American manufacturing increasingly more efficient and more competitive, leading to lower prices for manufactured goods. 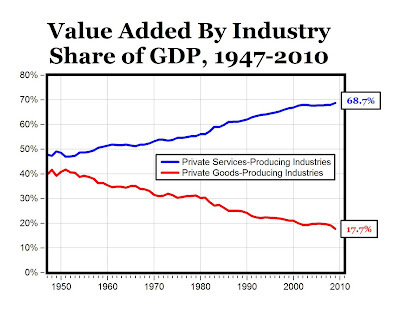 Because the productivity gains for manufacturing have exceeded productivity gains for services-producing industries, the prices for manufactured goods have fallen relative to prices for services, which had led to decreases (increases) in manufacturing's (service's) share of GDP and employment. HT: James E. Miller's post "The Good Krugman"
The chart above from GasBuddy.com shows that the national average gas price of $3.83 per gallon today (May 23) is slightly below the price a month ago of $3.84 on April 24. 2. Baltimore food trucks should be allowed to compete: It's unfair for the city of Baltimore to protect brick-and-mortar restaurants at the expense of food trucks. 3. Amazing photos of extraordinary homemade dams. 4. Oil and natural gas industry contributes $1 trillion (7.7% of GDP) and 9.2 million jobs (5.3% of total jobs) to the U.S. economy. 5. Christina Romer's plain, adult talk on the U.S. dollar. 6. Don't Sweat "Soft Patch II": In a few months we will be looking back at recent reports as just statistical noise. 1. World trade volume increased in March for the seventh consecutive month, bringing global trade to a new all-time record high (see chart). 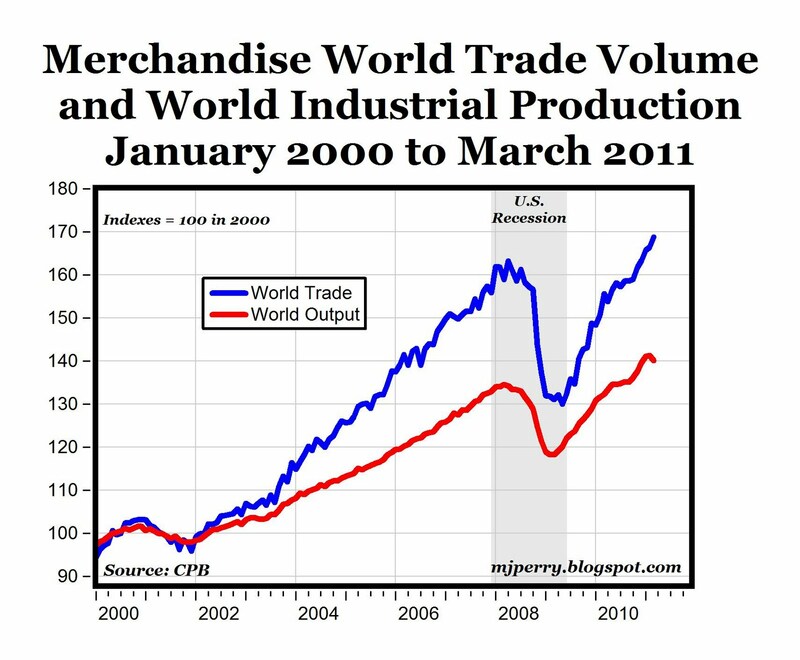 This was also the fourth month in a row that world trade was above the previous peaks during early 2008 when the U.S. recession and financial crisis started spreading, causing world trade to drop by 20% in 2009. 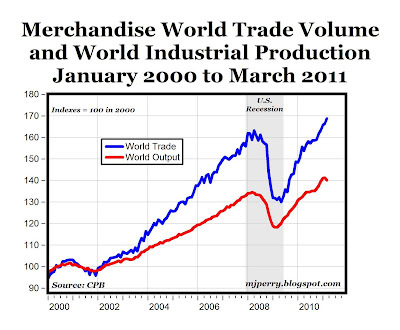 World trade is now 3.4% above the previous peak in April 2008. 2. World trade in March was 8.4% above its year-ago level, and marked the 16th consecutive month of annual growth in trade starting in December of 2009. Compared to the cyclical low in May 2009, global trade has increased by nearly 30% through March of this year. The CPB comments that "Trade momentum has been rising since November and remains strong. In the first quarter trade grew by 3.6% (non-annualized)." From the first quarter of last year, trade volume has registered an impressive 10.2% gain for the first three months of this year. 3. World industrial output declined by 0.8% in March from February, following a slight increase of 0.10% in the previous month. According to the CPB, the "March decline was caused by the disaster in Japan, where production plummeted by 14.9%," while growth in industrial output was positive in the United States, emerging Asia, and Latin America in March. For the first quarter of 2011, world output increased by 7% on an annual basis compared to the first quarter last year. Even with the Japan-related decline in March, world industrial output is 4.2% above the previous cyclical high three years ago in March 2008. Bottom Line: Though we still face many economic uncertainties moving forward, the strong economic recovery to date for world trade and world output is encouraging and hopeful. The fact that both world trade and world output are now 3-4% above their early recession peaks is clear evidence that the world economy has fully recovered from the Great Recession and financial crisis of 2008. I've reported recently (see posts here and here) about the Boston Consulting Group's prediction of a pending manufacturing renaissance in America because the labor arbitrage gains from manufacturing products in China are starting to shrink and will eventually disappear. Cost advantages for manufacturing are starting to shift back to America because of rising wages in China, along with rising prices there in general and an appreciating currency. "India’s outsourcing giants — faced with rising wages at home — have looked for growth opportunities in the United States. But with Washington crimping visas for visiting Indian workers, some companies such as Aegis are slowly hiring workers in North America, where their largest corporate customers are based. In this evolution, outsourcing has come home. Tata Consultancy Services, for example, is ramping up its North American presence in major deals with Citibank, Dow Chemical and Hilton Worldwide. It plans to hire more than 1,000 Americans in 2011 and to base 10,000 of its 185,000 global employees in the country." MP: Wages are increasing 11% per year in China and by 10% in India, which means that labor costs there are doubling every 7 or 8 years if those wage increases continue. Wages in the U.S. are rising by only 1.9% annually and at that rate it would take 37 years before wages would double here. At some point, the labor arbitrage advantages for China and India have to disappear. BCG predicts that “Sometime around 2015, manufacturers will be indifferent between locating in America or China for production for consumption in America." The Post Office might be cutting back on service and hours (it wants to end Saturday delivery by early next year), but TD Banks ("America's Most Convenient Banks") are doing the opposite, they're open 7 days per week. Here's a longer video (with narration) of the Maeklong Market in Thailand that operates alongside the train tracks (shorter version was posted a few days ago). Apple: 3 billion apps downloaded from users in 77 countries. Future: By 2024 the world’s enterprise servers will annually process the digital equivalent of a stack of books extending more than 4.37 light-years to Alpha Centauri, our closest neighboring star system in the Milky Way Galaxy. "Prince will be continuing his “Welcome 2 America” residency style tour with a gigantic stand of 21 nights at the Forum in Los Angeles, starting April 14." MP: Increasing the supply of concert tickets to satisfy fan demand is one market-based solution to reduce or eliminate the secondary market for re-selling tickets above face value. The L.A. Forum seats about 17,000, so Prince is supplying more than 350,000 tickets for his 21 shows. If that's not enough to satisfy demand, he can keep adding shows. There is also a wide range of ticket prices starting at $25 and going up to $425, which is another market-based, approach to help achieve "concert equilibrium," similar to the dynamic approach of airline ticket pricing. Update 1: For Prince's final shows next weekend at the L.A. Forum, there are plenty of tickets available from Ticketmaster at face value, and almost 1,700 ticket available at StubHub! starting at $45 (not sure how that compares to face value) and thousands more at SeatGeek starting at $55. Update 2: Just to clarify, I'm not against ticket scalping. The strongest opponents of ticket scalping are usually musicians and their managers, concert promoters, and venue owners. Ironically, it's those very critics of ticket scalping who have the power to reduce or eliminate ticket scalping by: a) raising ticket prices and/or b) increasing the number of tickets available for sale. By offering 350,000 tickets for sale in L.A., some at very high prices, Prince may have successfully reduced, or largely eliminated, ticket scalping for his shows. I applaud Prince's approach and suggest that it become a model for other musicians. MIAMI (CBS4) – "In a down economy, tourism in Miami-Dade County bucked the odds in 2010 setting records in every area, according to figures released by the Greater Miami Convention and visitors Bureau.If 2010 was a good year, 2011 promises to be even better, according to the bureau. Figures for the first quarter show hotel occupancy up more than 11 percent over the same period last year." "When the Rapture comes what's to become of your loving pets who are left behind? Eternal Earth-Bound Pets takes that burden off your mind. We are a group of dedicated animal lovers, and atheists. Each Eternal Earth-Bound Pet representative is a confirmed atheist, and as such will still be here on Earth after you've received your reward. Our network of animal activists are committed to step in when you step up to Jesus. Our service is plain and simple; our fee structure is reasonable. For $135 we will guarantee that should the Rapture occur within ten years of receipt of payment, one pet per residence will be saved. Each additional pet at your residence will be saved for an additional $20 fee. A small price to pay for your peace of mind and the health and safety of your four legged friends." 1. Talent Shortage -- "Employers say a talent shortage has saddled their efforts to fill jobs, according to a survey by ManpowerGroup. More than 50% of U.S. employers reported having difficulty filling "mission-critical" positions within their companies, up from 14% in 2010. Among the hardest positions to fill included jobs in skilled trades, sales and engineering." 2. Las Vegas Home Sales are the highest for the month of April since 2006. 3. Chile’s economy expanded at 9.8% in the first quarter - the most in 15 years - outpacing other major Latin American economies as consumer spending jumped and manufacturing recovered from the biggest earthquake in half a century. 4. New Jersey — Some $913.4 million in new state tax revenue has been collected or is expected to come in through next July, which offers a possible answer to some of the state’s immediate budget problems. Coming Soon to America: Increased Wait Times? GUARDIAN -- "Doctors in the U.K. are blaming financial pressures on the National Health Service (NHS) for an increase in the number of patients who are not being treated within the 18 weeks that the government recommends. New NHS performance data reveal that the number of people in England who are being forced to wait more than 18 weeks has risen by 26% in the last year, while the number who had to wait longer than six months has shot up by 43%. In March, 34,639 people, or 11% of the total, waited more than that time to receive inpatient treatment, compared with 27,534, or 8.3%, in March 2010 – an increase of 26% – Department of Health statistics show. Similarly, in March this year some 11,243 patients who underwent treatment had waited for more than six months, compared with 7,841 in the same month in 2010 – a 43% rise." Just How Close to a Train Track Can You Set Up a Vegetable Market? Pretty Damn Close! The chart above shows the top five imports and exports at the Port of Los Angeles for 2010, based on the number of loaded containers. 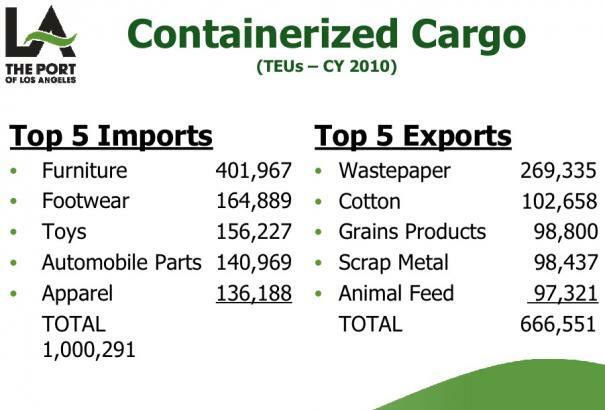 This Business Insider story points out that the top five U.S. exports are raw materials, while the top five imports are finished goods. Bottom Line: The real prices of furniture, toys, apparel and footwear have all fallen substantially over the last ten years, by double-digit percent declines, and the real price of auto parts has increased. Furniture, toys, apparel and footwear all require very labor-intensive production processes, and by purchasing these products from Mexico, China, Vietnam and India where labor costs are low, American consumers have probably saved many millions, if not billions of dollars. It's probably not a coincidence that the top imports coming through the L.A. Port are some of the products that have fallen the most significantly in real price over the last decade, to the great benefit of America's consumers. Remember that countries don't trade with each other at the national level, people trade; and t's American consumers who are shopping globally for the best price and value. For furniture, clothing, footwear, and toys, cost-conscious American consumers are wisely taking advantage of the falling real prices for those items that are imported from overseas, and that bargain-hunting consumer behavior ("consumer greed") is being reflected in the import volumes at the L.A. Port. "Amazon has announced that it now sells more Kindle ebooks than all print books – that's hardcover and paperback combined – through the Amazon.com site. Introduced less than four years ago, the Kindle has quickly become Amazon's top selling product, and now digitised books for the reader have become more popular with its customers than their paper and ink fore-runners." The "Big Five" made almost $68 billion in profits last year. No, not the "Big Five" oil companies that have been in the news lately for making $77 billion last year in profits. I'm talking about that other "Big Five": Microsoft ($18.7 billion), IBM ($15 billion), Apple ($14 billion), Intel ($11.4 billion) and Hewlett-Packard ($8.8 billion). And when you add the next five most profitable computer companies - Google ($8.5 billion), Cisco ($7.8 billion), Oracle ($7.7 billion), Dell ($2.63 billion) and Ebay ($1.8 billion) - the "Big Ten" raked in almost $100 billion last year in "windfall" profits last year ($96.1 billion), boosted by strong demand for IT products as the U.S. and global economies recovered from the Great Recession. Suppose that Congress next investigated "Big Computer" for earning almost $100 billion in record profits last year, and imposed a higher tax burden on the "Big Ten." Q: What would likely happen to computer prices for the "Big Ten's" products; and what would likely happen to "Big Ten" spending on capital equipment and research? A: Prices would probably be higher and investment spending would probable be lower. And that's exactly what would likely happen to oil prices and investment spending by the other "Big Five."